The challenges facing Chicago – pension debt, poor election turnout, a powerful mayor who can steamroll the City Council – are problems with clear solutions. So argue the authors of a new book that charts a path for government reforms in the city. 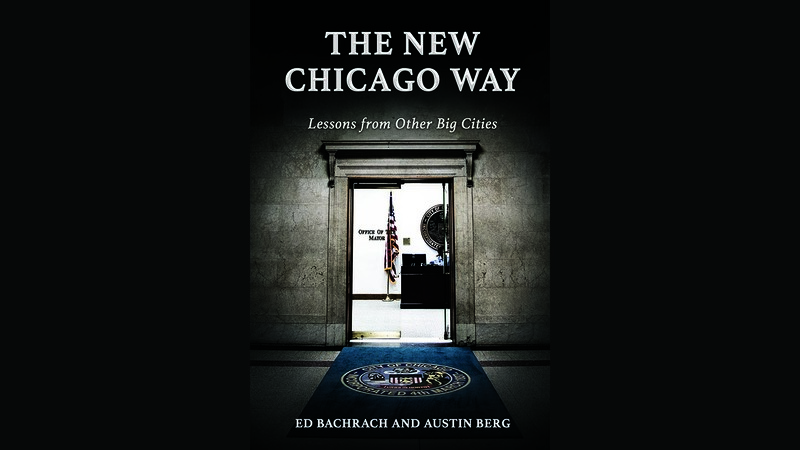 Co-authors Ed Bachrach, founder and president of the Center for Pension Integrity, and Austin Berg, director of content strategy at the Illinois Policy Institute, join us in conversation. Mike Daffenberg awoke before sunrise. It was the morning of March 31, 2003. Daffenberg was an air traffic controller. Each weekday he drove to Chicago from his home in suburban DeKalb, arriving before the start of his 6:00 a.m. shift. This day was no different, it seemed. What Daffenberg did not know was that before he had his morning coffee, before he put on his uniform, before he even got out of bed, a politician had ordered the bulldozing of his place of work under the cover of darkness. Mayor Richard M. Daley had launched a clandestine attack on Meigs Field. Select city lawyers knew about the mayor’s plan to capture the Northerly Island airfield, as did Daley’s chief of staff and two city officials. Left unaware were, to name only a few, all fifty city aldermen, the governor of Illinois, the Federal Aviation Administration, and the Department of Homeland Security—and Daffenberg, of course. He learned of Daley’s decision while driving to work. “I felt like I was laid off by the radio,” he told the Chicago Tribune. A lone camera, stationed just north of the Northerly Island airfield at the Adler Planetarium, would have captured a live feed of the Meigs assault. But a city fire truck trained a spotlight on the lens, blinding the public eye, at the very start of the operation. Backhoes carved six menacing “X-shaped” ditches into the runway. Sixteen planes sat stranded at the airport, which had seen 32,000 flights the year before. Little Meigs was the most famous single-runway airport in the world. In early versions of the popular Microsoft video game Flight Simulator, Meigs Field was the pilot’s default starting point. The views were iconic. But Meigs was not just a pretty face. Writing for the Chicago Tribune, John McCarron described it as an “economic jewel.” Meigs filled a niche demand among business travelers looking for easy access to Chicago’s central business district. Daley justified the raid as a matter of national security. Meigs, he said, had become a potential launching pad for terrorist attacks. The nation’s top domestic security official at the time did not echo Daley’s concerns. When repeatedly questioned by reporters in April 2003 as to whether Daley’s closure made Chicagoans safer, Homeland Security Secretary Tom Ridge refused to say yes. “I’m disappointed they closed it,” Ridge said. He confirmed that Daley did not give him any advance notice of the closure. The Aircraft Owners and Pilots Association, which boasted nearly 400,000 members at the time, also dismissed the mayor’s reasoning. “Aircraft utilizing Meigs Field pose no threat to the greater Chicagoland area, and certainly no greater threat than aircraft in transit to and from O’Hare and Midway,” the association stated in a 2003 lawsuit challenging Daley’s attack. The public wasn’t buying it either. A June 2003 poll conducted by the Chicago Tribune revealed 65 percent of Chicagoland voters disapproved of Daley’s raid on Meigs. A resounding 70 percent disagreed that the airfield, when operating, had heightened the likelihood of a terrorist attack. It appears that the first time Daley publicly voiced safety concerns regarding Meigs was after his raid. But over the course of his mayoral tenure, he frequently stated his desire that Northerly Island be transformed into a city park. Today, it is. Neither the Daley administration nor the City of Chicago incurred any punishment for the actions at Meigs, save for a small fine levied by the Federal Aviation Administration for failure to give adequate notice of the closure. Members of the city council took no legislative action. The Park District, headed by a Daley appointee, complied with the mayor’s orders. And city lawyers disposed of lawsuits against the administration in short order. Judges had lifted all potential legal barriers by the end of May, and demolition was under way by summer. Pacific Construction Services, which counted former Daley aide and former Park District COO David Tkac in its ranks, won the $1.13 million contract to put Meigs out of its misery. The mayor’s decimation of the airfield is not difficult to criticize. After all, Meigs was a world-renowned landmark; it served a respected role in air transportation and brought jobs to Chicagoans. But none of these particulars should be the primary concern to a critical eye. Instead, the raid on Meigs is appalling for what it reveals about how Windy City government operates. A rubber-stamp city council, a lapdog board appointed by the mayor, hurried decisions, clout-heavy contracts, lack of fiscal considerations, secrecy, centralization, and destruction. These are hallmarks of Chicago governance. This is the Chicago Way, and it was on display at Meigs in 2003. Much more than merely fodder for headlines, the Meigs raid represents a microcosm of the political culture that has brought Chicago to its knees. Discerning citizens now see its influence in the schools, in city ledger lines, in elections, in mini-fiefdoms controlled by local aldermen, and in the harrowing, grainy footage of young men gunned down by police. Meigs lays bare the perverted political process in Chicago, one fueled by dangerous decision making built on the will of a single person. Indeed, the Windy City is a modern metropolis of millions functioning with a government built for one-man rule. Deliberative democracy is dead here. Chicago is home, rather, to a form of government that resembles strongman authoritarian regimes that persist in far corners of the world. The mayor is the strongman; any perceived checks on mayoral power were proven illusory on that night in 2003. And they remain illusory. More than 2.6 million Chicagoans live under this broken structure of governance and the political pathologies that arise from it. It seems at times that the whole city is Meigs Field—a property upon which the mayor can impose his or her will at any time, for any reason, with little resistance. Chicagoans stumbled upon that truth in 2003.